GR88 Casino already had a great selection of instant-play Microgaming games and now they've gone and added a whole bunch more slots and table games from Play'nGO. These are really nice games that you don't see at a lot of other online casinos, so check 'em out! Now is a good time to do that since you can still claim a nice New Years Resolution Bonus! I really like these Play’nGO’s games. They're bright and animated and have some excellent bonus features. From ancient treasures and dastardly pirates to enchanting fairies and high tech monsters the games are innovative interpretations of the most popular slot machine themes. 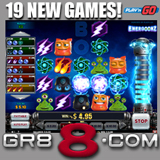 The new games include Energooz, Play’nGO’s most sophisticated game yet. It’s not a slot machine -- graphics and gameplay is more like popular games in the social and casual space. Energy and cute monster symbols drop down in a grid to form winning combinations. In Rich Wilde and the Aztec Idols players join a swashbuckling adventurer on his quest for treasure. Wild Blood is a gothic vampire-themed game with an expanding wild. Enchanted Meadow takes players into a mythical world of fairies and elves where a Tree of Life is an expanding wild and a Bonus Game awards free spins and up 5x multipliers. Free spins can be re-triggered for up to 50 free spins. For golfers there’s Golf Trophy 2. Creatures from a tropical reef spin on the reels of Pearl Lagoon and on Ninja Fruits it’s Asian warriors and tropical fruit. Dragon Ship is a high-seas adventure and Myth is inspired by ancient Greek folklore. Most of the games have a Gamble feature that gives players a chance to double their win by guessing the colour of the next card dealt or quadrupling the win by predicting the suit of the next card. Many have bonus games that award free spins and bet multipliers. You can bet up to 5 coins per line and coins can be valued from a penny to twenty-five cents each. Bets range from as little as a penny up to a max bet of $25 per spin on the 20 line games. New table games include European, French and English Roulette; two versions of Blackjack; Pai Gow and Baccarat as well as a Texas Hold’em game. GR88’s New Years Resolution Bonuses continue until the end of the month. Players are choosing resolutions and receiving up to 100% bonuses. Players can pick their resolutions and unlock their bonus at http://offers.gr88.com/newyear.